Relax in the Smokies and inhale that Sweet Mountain Air at this lovely semi-private cabin in Pigeon Forge! 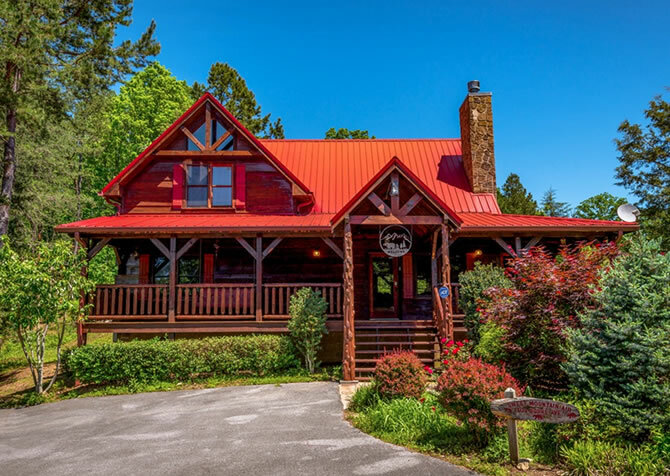 With 3 bedrooms, 2.5 bathrooms, and a game loft, this Smoky Mountain home has plenty of room as well as entertainment for up to 10 guests — great for family getaways, couples’ retreats, or trips with friends. At over 2,000 square feet, this spacious property offers a peaceful location, tranquil wooded views, and great amenities inside and outside. Spend quality time with loved ones and a feature film on the big screen TV, play games in the rec loft all night, sway away your worries with a cup of joe on the porch swing, bake tasty treats in the fully equipped kitchen, and unwind in the outdoor hot tub every evening. If a restful and rejuvenating stay is what you seek, Sweet Mountain Air is the perfect cabin for YOU! Bringing nature indoors, Sweet Mountain Air features log accents, black bear décor, a gas fireplace surrounded by stone, and hardwood floors throughout the open living area. Once you arrive, feel free to leave your bags in the car and plop on the sofa (which doubles as a queen sleeper) or curl up with a good book in the arm chair. When you feel refreshed and ready, explore the rest of the cabin or flip on the big screen TV to catch up on your favorite comedy series. Better yet, pop in your favorite DVD and start movie night early — this is your vacation after all! After the popcorn vanishes from the coffee table and the rest of the gang hits the hay, fix a cup of herbal tea, light a toasty fire, and open a good book for a bit of alone time. Interested in saving money for Smoky Mountain souvenirs? Stock up on fresh ingredients, cool drinks, and scrumptious snacks from the grocery and store everything in the fully equipped kitchen — complete with sleek black appliances, pots and pans, mugs, dishes...you name it! Easily whip up homemade meals throughout your stay and curb midnight munchies in a flash. And if you’re more than happy to eat out and try all the local specialties, then this kitchen will come in handy for delectable leftovers, morning coffee, and in-between-meal refreshments. With so much food to be enjoyed, a dining space is a great extra while on vacation. The dining table for 6 boasts a polished finish and cushioned chairs, keeping you and your guests comfortable at every meal. There’s even a picnic table on the screened-in porch nearby; simply open the door and enlarge your dining space with ease. Plus, with an open floorplan throughout the home, the kids will enjoy eating their meals in the cozy living space with their favorite TV show. And when the food has settled, clear the table for a board game brought from home or bought in town; the chandelier overhead and windows all around provide great lighting so everyone can play with ease. Looking for a bit of fun? Head upstairs to the game loft, featuring a pool table, boom box, game table, and pub table for 2. Challenge your bestie to a game of wits (aka chess), take on the whole family in an epic pool tournament, groove all night long to your favorite CD classics, and enjoy a drink or two with your spouse. Plus, the wooded views help create calm and cool vibes, so dance moves and gaming antics don’t get too out of control. And if the youngsters choose to hang, the futon is perfect for chilling…or passing out after endless hours of play. When everyone’s tuckered out or just craving some privacy, split off into 3 bedrooms — each with their own TV, ceiling fan, and cabin-cozy furnishings. Choose from 2 entry-level bedrooms with queen-size beds or the master suite with a king-size bed and private en-suite bathroom on the second floor. Soothe tired muscles in the large bath, unwind in the cushioned wicker rocking chair, slip into the cool sheets, and enjoy a TV show before catching some Zzs. Pull up the steep, paved driveway to a flat, paved parking area for 3, then head up 8 steps to enter Sweet Mountain Air. Or hold off on exploring the cabin to check out the charming outdoor amenities along the wraparound deck. Start off with a gentle sway on the front porch swing before heading to the screened-in portion at the back, harboring a round picnic table, 2 ceiling fans, whimsical rocking chairs, and a relaxing hot tub. Dine with a mountain breeze, sip sweet tea with a woodsy view, and soak in the bubbly water each day. But wait — (you know the drill) there’s more! At Sweet Mountain Air, take advantage of free high-speed wireless internet to keep up with emails and check out our blog as well as a VCR to relive precious moments from the past. Located just outside of Pigeon Forge, Sweet Mountain Air is not far (less than 5 miles away) from the exciting Parkway. Home to go-kart tracks, arcades, miniature golf courses, outlet stores, family-friendly attractions, local events, and dozens of great restaurants and candy shops, Pigeon Forge has something to keep everyone entertained — from the youngest children to the seniors in your group. And once you’ve had enough excitement in town, you can escape to the comfortable and cozy Sweet Mountain Air. Soar around and down the mountain at Coaster at Goats on the Roof — where you can see live goats actually on the roof as you glide past. Find precious gemstones from around the world at the Pigeon Forge Gem Mine, then turn them into stylish jewelry and have them shipped hassle-free straight to your home! Enjoy a shopping spree in town at the Pigeon Forge Factory Outlet Mall (aka the Red Roof Mall), where handmade souvenirs, stylish clothing, and home décor await.